Free health screenings are being held in advance of a public presentation on halting the rise of obesity and diabetes. The screenings are to help members of the public know their health status and be more informed about their numbers. The public is invited to the free presentation on Tuesday, 16 January, from 6:30 pm to 8:00 pm at the Hamilton Princess, where local and international experts and the public will talk about how we can halt the rise of obesity and diabetes. There will also be a mini health screening from 5:00pm to 6:00pm at the Hamilton Princess before the Tuesday, 16 January presentation. Minister Wilson gets a free health screening. Minister of Health, Kim Wilson, dropped by one of the free health screenings, and she said, “Members of the public can find out more about their personal health at these free pop-up health screenings brought to you by the Department of Health, the Bermuda Diabetes Association and VITALS in advance of the presentation. “I really want to encourage the public to join us at the Hamilton Princess on Tuesday, the 16th. There is so much to be learned from each other and your input is vital,” the Minister added. The screenings will be held from 11.30am to 1.30pm each day. “Diabetes is a disabling condition that can have fatal consequences. Associated problems include the early onset of blindness, kidney failure, damage to circulation and nerves in the legs that can lead to amputation, circulatory problems, heart disease and stroke. Bermuda has one of the highest amputation rates per capita in the world,” the Ministry said. “Obesity, and the lifestyle choices that cause it, lead to the early onset of preventable diseases. Diabetes is just one. There is now evidence that connects obesity to 13 different kinds of cancer. 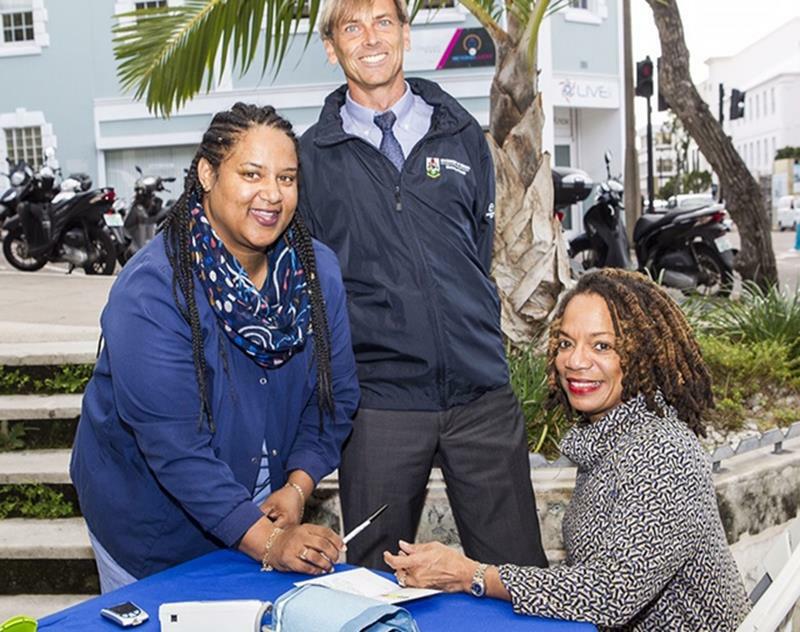 Minister Wilson; Director of the Department of Health, David Kendell, and Department of Health’s Community Health team member Debrina Simons. “It is commonly accepted that there are many additional undiagnosed cases of diabetes. 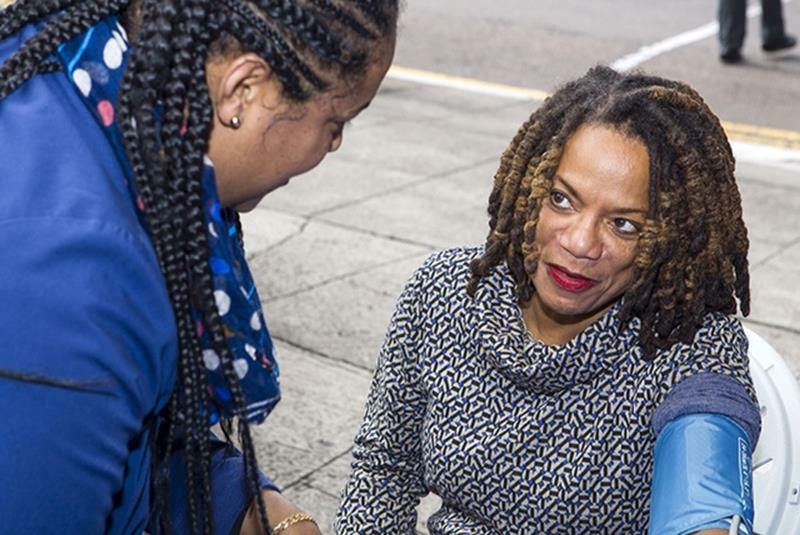 In fact, in a recent Ministry of Health initiative called ‘Taking it to the Streets’, our community health nurses surveyed 361 people and sent 126, or about one-third, for further medical assessment. Further testing was due to high blood pressure and high blood sugar readings. 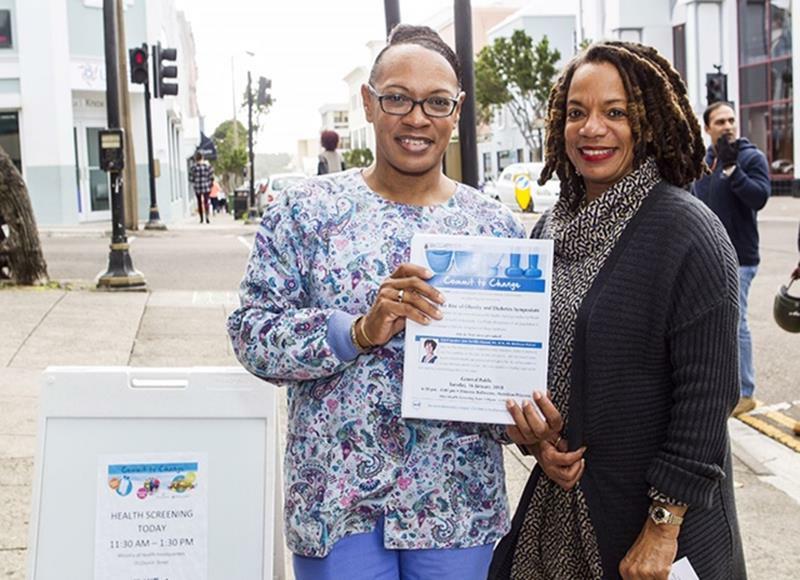 Minister Wilson and Department of Health’s Community Health team member Fredericka Tucker with the ‘Commit to Change’ presentation flyer.